If you’ve ever been in a situation where your phone processes things at a slower speed or notifications fail to drop or you find it difficult to accept files into your device or can’t play games because of insufficient storage, you would understand why it’s important to always manage the storage of your device. People keep complaining on forums, social media platforms and blogs about their inability to receive messages, emails, or messages from chats. While other things can be responsible for that, most of such cases are due to inadequate space on their devices. Whether you’re are a casual user or heavy user of smartphones, it’s important to have enough storage space. Not only will your device function healthily, you will be able to perform several operations with your device. In the next lines, I will provide relevant information on how to manage storage or free up space on your Android devices and smartphones. Aside from the internal storage of a smartphone, there is always room to mount a micro SD card of a particular size – depending on the capacity of the device and your storage needs. This allows you to have additional space where you can save some of your files. There are quite a number of sizes you can purchase to add up to your storage needs. Depending on your needs, you can go for 8GB, 16GB, 32GB, 64GB, and above. Well, having a micro SD card will save you a whole lot of storage headache, but you should really know what to save there. While quite a few numbers of phone users have come to realise the essence of having a micro SD card to shift storage demands, so many others are yet to come to grasp with this basic need. Truth be told, phones that come with large storage of 64GB, 128GB, 256GB are often expensive, and not so many people can afford them. Mounting a memory card becomes a good alternative for expanding the storage capacity of your Android phone. And other files that are not directly needed for the performance of your phone. You can use a third-party app such as Files Go, DU Speed Booster, or any other suitable app to successfully and neatly transfer your apps from internal storage to a micro SD Card. Application cache refers to an app-specific storage based on a little amount of data such app has collected during usage. For instance, if you use App Freezer to manage space or Google Chrome, the app automatically stores bytes of information some of which are downloaded from the internet. Next time you intend using the app, such information will no longer be downloaded as it is already being saved by the app on the cache. As useful as this strategy might appear, it takes up the storage on Android, especially when you use several apps over a long period of time. While the caches of some apps consume very small space, some, however, take up megabytes of space. In such situations, clearing the caches or resetting the app will help free up some space on your Android phone or device. Every smartphone comes with an interface for accessing the settings and then a means of clearing the cache of particular apps. But before you clear an app’s cache, you need to understand that …. User data such as login details, bookmarks, history, setting, and any other information captured during usage will be lost. The app will reset to its default or original state just as when it was newly installed. With the above brief insight on app cache, it’s clear that you might not need to clear the cache of some of your important apps, especially those whose password you might have forgotten. Open the Settings menu and tap App to access all the apps installed on your phone. Then tap the app, whose cache you intend to clear, to reveal a few metrics about it. 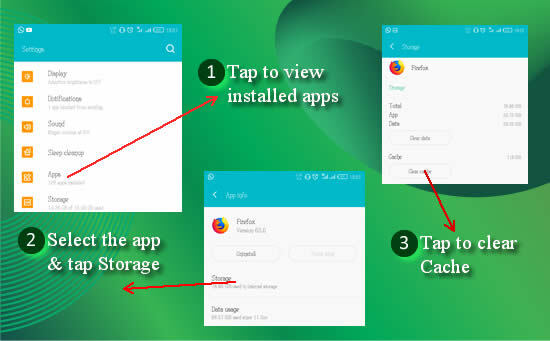 For some UI or OS, you will need to tap on Storage and then Clear cache. Doing the above will reset your app and the next launch will assume it’s the first time you are using the app on the device. Initially, I stated that you can move your apps to a micro SD Card using third-party apps like Files GO or DU Speed Booster. This is because, these apps present easy-to-use and advanced options for doing so. In addition, these apps handle other storage management features - aside from apps transfer – which are really cool to use. The development of recent files managers takes the initiative of expanding their capabilities to helping phone users manage the storage available on their devices. While DU Speed Booster rocks high in this particular role, I have found Google’s Files GO to be more useful. First, Files GO takes up little space as it’s relatively small in size. Similarly, it has a number of features that enhance storage management. I have listed them below. The above features, as you can see, help you to manage space on your Android phone within a single app. This saves you the hassle of navigating through your phone to carry out some of these functions. Launch Files GO app – in case you don’t have this app, you have to download and install it from your favourite store. Once the app is launched, tap Clean to access the cleaning features available. Select the duplicate files you would love to remove. Then tap Delete at the base on the screen. Select Delete from the next pop-up and wait for the selected files to be deleted. Will I not lose the deleted files? No, you won’t! These are copies of the same file you already have on your phone. Additionally, Files GO does the good job of saving a copy of duplicate files in the event where you delete both files using this feature. While it’s possible to find and uninstall rarely used apps using third-party apps like Files GO, sometimes, it’s advisable to freeze rarely used but relevant apps using an app freezer. This saves you the need to download and re-install such app when needed. An app freezer removes a frozen app from the storage of the phone and makes it appear as if it does not exist. For instance, if a particular app takes up 500MB of space, you can simply freeze this app to clear such space for other needs. When next you need this app, with just a few taps, you can unfreeze and use it. This is not only an efficient way to free up space, it equally aids you to manage how some apps operate and use storage on your device. One major hitch with some of these app freezers is that they can, supposedly, disappear making it difficult for you to unfreeze frozen apps. But, fear not because you can easily unhide an app freezer that seems to havevanished. I have used the word unwanted apps to refer to apps you no longer need or use, and apps you have installed by mistakenly tapping adverts on games or other sources. Also, malicious apps installed because you allowed permission to install apps from unknown sources. Why allow unwanted apps to take unnecessary space when there are several other files and apps to store. So, the best shot once you spot irrelevant apps on your device is to uninstall them alongside their residual folders. Once again, third-party files managers such as DU Speed Booster can remove the workload off your neck by helping you identify and uninstall these apps. Alternatively, you can uninstall unwanted apps you have spotted via the Settings menu. This I’m going to show you below. Open the Settings menu of your phone and tap Apps to see all the apps that have been installed on your device. Tap the app you want to uninstall and then tap Uninstall. Tap OK as answer to whether you want to uninstall the app. This will remove the app from your phone. For some of these apps, you will need to use a file manager to access and delete the residual folder or files for a clean uninstall. Some OS, e.g. 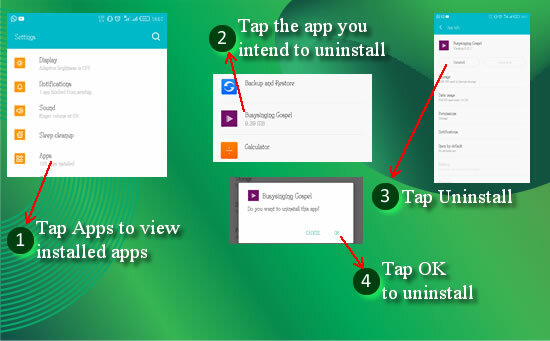 XOS Chameleon, allows you to long press an app to access the uninstall option from the context menu which is a faster way to uninstall an app. Sometimes we ignorantly accumulate duplicate files on our Android phones and devices that shouldn’t be allowed. I used the word ignorantly because you might not be aware of how these duplicate files came to be. Well, some people are aware and choose to allow the duplicate for some reasons. When you send a particular file using a social media app such as Facebook, a copy of that file is saved in the sent folder of the app, resulting to two of such files on your device. Re-downloading a file that already exists will create a duplicate copy. Unlike PCs, Android will add 1, 2, and so on to any file with the same name. When you have the above situation, what do you think is best to do? Just delete the duplicates, except when they have special meaning or roles. But, how do you find them, especially if they are in different folders? Well, you can use special searches on file managers to find files that belong to a particular group (e.g. extension, format, etc.) and then look through for duplicates. Really? I guess you asked the same question. That can be frustrating, inefficient and time-consuming. To avoid the stress and lessen time, use Files GO to easily spot these duplicates and then delete them. You can refer to point number 3 above to find out how to remove duplicate files using Files GO. Ever since cloud storage came into existence, the rate at which people lose information has reduced. This is because cloud platforms provide us with alternative backup accessible anytime from any device across the world. Though many have come to embrace the role cloud storage plays in saving and retrieving files, only a few persons utilise this innovation to save storage space on their Android phones. Yes, cloud storage proves an important avenue for you to free up space on your device. Not only is this accessible all the time, but it is also easy to set up and use. There are several cloud platforms available at no cost you can save your files on. It’s simple! Move some of your pictures, videos, e-books, etc. to any cloud storage platform of your choice. Google Drive, OneDrive and DropBox offer free storage accounts that you use to manage storage and free up space on your Android device. These platforms have apps you can install on your phone to easily send retrieve files from them. Sometimes we download WhatsApp profile pictures or the WhatsApp statuses of our friends for immediate or later use. Also, we send documents, pictures, videos and other files to our contacts and group(s). For each sent item, WhatsApp saves a duplicate copy separately on a folder called Sent. Same with downloaded profile pictures that are saved on the Profiles folder. These, depending on the number of files you sent and downloaded over time, take up a sizeable amount of space on your Android phone. To manage the storage of your device, it’s advisable to delete some of the media and files you have sent or downloaded. Either way, you would have released enough space on your Android device. The path is quite easy…. Using any file manager available on your phone, you will have to visit specific directories where you can delete items you have sent. Be careful not delete items you recently sent that you’re not sure if the recipient has downloaded unto his or her device. Otherwise, you will need to resend and WhatsApp will yet again save a copy on that same folder. You can also delete voice notes, wallpapers no longer in use and profile pictures you have downloaded. In the last tip I showed you how to delete sent files on WhatsApp and downloaded profile pictures. Here, the approach is different and focuses on the files you receive or have downloaded while using one of the social media Apps like Facebook Messenger, Instgram, Twitter, among others. Sent files should be deleted as much as possible to avoid the existence of duplicates which will consume unnecessary space on your device. Rather than delete downloaded and received files, you can move them to an SD card or transfer to cloud before deleting. This will provide a healthy backup for you to make use of later. You will have to navigate to the folders for each of these social media apps to delete these files. Once you have spotted the files, transfer them to an SD Card or cloud, depending on your preferred storage platform. Android Packet Kit (APK for short) files are the file format for installing apps on Android OS. Think of APK files as the equivalent of execution files that run on a Window Operating system that a PC has. Or any other means available. One thing with the above methods is that they leave the apk file on your phone even after installation. 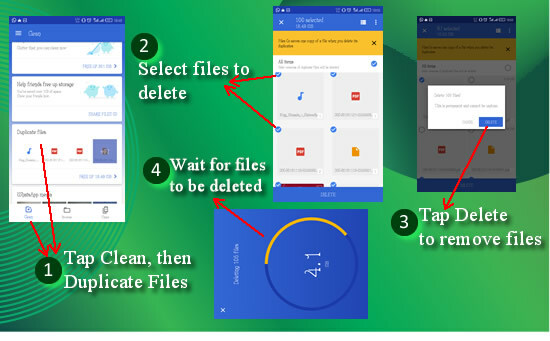 Good enough, if you have a good file manager or an app that manages the storage on your phone, you can be prompted to delete the file after installation. So, what happens if you are not prompted? Simple! The file remains on your device and gradually consumes enormous space. For the sake of managing the available space on your Android phone, it is advisable to always delete these files after installing them. There are quite a number of ways to do that, but it’s effective and time-saving to use files management apps such as DU Speed Booster, XOS Xmanager, among others. Even if you don’t have a third-party app to do so, the built-in file manager can help you in a very simple way. You can find and delete apk files using a file manager that comes with your device. Launch a file manager and access the search feature. On some file managers, the search feature is usually being represented with a hand lens icon. You might equally need to tap on the menu to see the feature on some other file managers. Once the search feature is functional, enter .apk in the search bar and search. Ensure that there is not between the dot(.) and apk. This will display all the apk files on your phone. Now you can delete those you don’t need again. 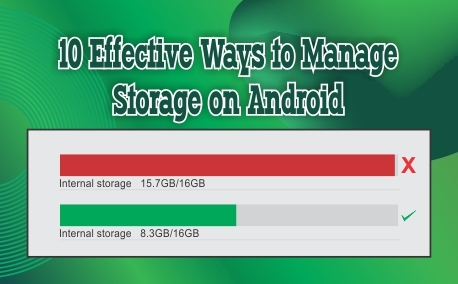 It’s great you laid your hands on a very good resource on how to manage storage on Android phones and devices. As earlier stated, ensuring that your phone has enough storage to support its processes is critical to the its overall performance. It’s not mandatory for you use all of these ways to free up space on your device, but it’s not out of place to use all of them. The focus is to ensure that your device has enough space to allow default apps and services function effectively, whilst providing storage for you to save your files also. Whatever method you feel is application to your device and needs can be used. Don’t forget to tell us how you feel about this piece of information via the comment section or contact form.